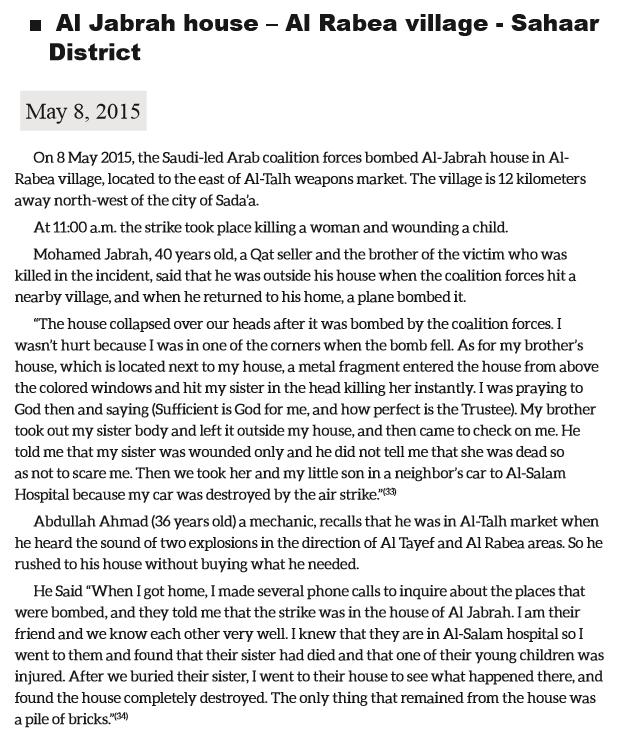 On May 8th 2015, the Saudi led coalition declared the whole of Sadah city, which was home to 50,000 people a military target. Up to 23 civilians were killed and a further 32 were injured across this and the neighbouring region on this day alone. “Starting today and as you all remember we have declared via media and leaflets that were dropped on Marran and Sa’da, and prior warnings to Yemeni civilians in those two cities, to get away from those cities where operations will be carried out. This warning will end at 7pm today…We have also designated Sa’da and Marran as military targets loyal to the Huthi militias and consequently the operations will cover the whole area of those two cities and thus we reiterate our call on civilians to stay away from these groups, and leave the areas under Huthi control or where the Huthis are sheltering”. This followed news that, according to Saudi Arabian government sources, cross-border rocket attacks launched by Huthi armed groups had killed five civilians and injured 11 others in the Saudi Arabian city of Najran. Residents of Sa’da governorate told Amnesty International that leaflets were dropped by coalition aircrafts warning the entire civilian population to leave by 7pm that evening. The following day, in a further statement, the coalition spokesperson suggested that in fact the coalition may have even treated the entire Sa’da (governorate) region as a military target. Treating an entire city or region as a military target, even if there are military objectives located within the area, violates the prohibition of indiscriminate attacks. International humanitarian law stipulates that ‘effective advance warning shall be given of attacks which may affect the civilian population, unless circumstances do not permit’. However, the coalition’s warning was not effective. It was vague and overbroad, encompassing two entire cities with tens of thousands of civilian residents. The later statement appeared to suggest that its geographical scope extended to the entire region. Without electricity, most residents had no access to television, and the leaflets dropped by coalition aircraft could not possibly reach all residents. Even had all affected residents received the warning in time, it would have been unrealistic to expect tens of thousands of civilians to flee within the timeframe – a few hours – given the shortage of fuel and transport in the area. In addition, previous coalition airstrikes targeting vehicles travelling on roads out of Sa’da governorate (including towards Sana’a, the most likely direction of travel for civilians fleeing Sa’da governorate) may have discouraged some residents from leaving the city of Sa’da for fear of such attacks. The coalition’s ultimatum to the civilian population to leave Sa’da governorate (and Marran) was not accompanied by any reassurance that they would not be at risk of attacks while travelling or designation of safe routes. In any case, warnings do not release an attacker from the prohibition of directly attacking civilians or civilian objects or from the obligation to take other necessary precautions to spare civilians. Civilian homes do not become military objectives only by virtue of their inhabitants having been warned. By the same token, warnings do not diminish the attacker’s obligation to weigh expected collateral damage against the anticipated military advantage and make sure the impact on civilian objects is not disproportionate. The daily report by the Legal Center for Rights and Development lists 13 civilians killed and 17 injured in Saada province that day as well as 10 killed and 15 injured in Al-Jawf province which lies next to Saada. In addition, in the area of Saada, a religious shrine, communications networks, residential neighbourhoods, government sevice buildings, a school, a bakery and a public marketplace were also destroyed. Mwatana reported a lady killed and a child injured when a house was bombed that day in Al-Rabea village on that day, Sahaar District, which is 12 kms north-west of Saada city.